The regime which regulates and protects Aboriginal heritage in Victoria is about to undergo a significant change. The Aboriginal Heritage Amendment Bill 2015, which was passed by parliament on 22 March 2016, introduces a suite of substantive and administrative changes to the Aboriginal Heritage Act 2006. The general scheme of the Act remains in place. The Act will continue to provide a regime by which Aboriginal heritage may not be harmed, other than in accordance with cultural heritage management plans, particular types of agreements or permits granted under the Act (or other exception). The key bodies created or appointed under the Act, being the Victorian Aboriginal Heritage Council and Registered Aboriginal Parties (or RAPs), remain (albeit subject to some new rules and altered roles). The Victorian Aboriginal Heritage Register also remains, but is given some new work to do. Within that same general scheme, the Amending Act makes significant changes to existing features and introduces some wholly new ones. We highlight just some of these changes, which may be of particular relevance to Victorian Government departments and agencies. The Bill provides that where there is a RAP for an area, applications for cultural heritage permits must be made to the RAP for the RAP to consider and determine. The Secretary to DPC remains responsible where there is no RAP for an area. Public land managers will be able to use a new mechanism for managing Aboriginal cultural heritage, called Aboriginal cultural heritage land management agreements. The new agreements are intended to remove the need for public land managers to apply for a cultural heritage permit each time they wish to undertake low impact works which are likely to affect Aboriginal cultural heritage. The agreements may be made between RAPs and public land managers. Public land managers include a committee of management, the Secretary of DELWP, Parks Victoria, VicRoads, VicTrack, a water authority or a local council. The agreements are only available where a cultural heritage management plan is not required. The Amending Act allows a person proposing an activity to prepare a preliminary Aboriginal heritage test to determine whether the activity requires a cultural heritage management plan. The test can be submitted to the Secretary, who must then certify the test or refuse to do so. The Victorian Aboriginal Heritage Register is the repository of all known Aboriginal places and objects, as well as the repository of details of agreements made and other matters. Access to the Register is restricted to specified persons for specified purposes. The Amending Act specifies that additional people may access the Register, including public servants responsible for planning permits and planning scheme amendments. At the same time, access to sensitive information will be more closely held, and it will be an offence to use information obtained from the Register for an unauthorised purpose. Finally, Traditional Owners, through RAPs and the Council, will be able to nominate particular information held on the Register to be classed as sensitive and subject to extra protection. The Amending Act creates a new category of heritage called 'Aboriginal intangible heritage'. 'Aboriginal intangible heritage' includes any knowledge of Aboriginal tradition, other than cultural heritage or knowledge which is already widely known to the public. Aboriginal intangible heritage needs to be recorded on the Register to be protected. In simplified terms, it will be an offence for Aboriginal intangible heritage to be used for commercial purposes without the agreement of the appropriate registered Aboriginal party. It will also be an offence to fail to adhere to any intangible heritage agreement once made (but intangible heritage will generally be excluded from the other offence provisions). The Amending Act empowers authorised officers, previously known as inspectors, and Aboriginal heritage officers, who are employees of RAPs appointed by the Minister, to issue a 24-hour stop order to protect Aboriginal heritage from acts that harm it, or are likely to. It is an indictable offence to not comply with the stop order. Authorised officers will also be empowered to issue improvement orders, which require the person to remedy a contravention of the Act. The Amending Act clarifies and alters the existing offences. It will be an offence to act, or omit to act, in a way that knowingly, recklessly or negligently harms Aboriginal heritage. The Bill also introduces a strict liability offence of harming Aboriginal heritage (which carries a lesser penalty than the offences with a mental element). It also provides that officers of bodies corporate may be personally liable for acts by the body in prescribed circumstances. With some exceptions, the new provisions may apply to officers of statutory bodies corporate, so it is important to be aware of these changes. The Amending Act establishes a new system for managing Aboriginal Ancestral Remains (Aboriginal skeletal material). First, it requires all institutions to report on any remains in their collections to the Victorian Aboriginal Heritage Council within two years of commencement of the Act. This requirement applies to all museums, hospitals and other state agencies and institutions. Second, the Amending Act requires all remains to be returned to the Council for its management. If the Council, or relevant Traditional Owner, is not able to care for the remains, they are to be deposited at Museum Victoria for safe keeping. Victoria has renewed its commitment to energy efficiency targets with the introduction of updated targets for the next five years. As a large energy consumer, government plays an important role in achieving these abatement targets - 5.4 million tonnes of carbon dioxide equivalent in 2016, steadily increasing each year to 6.5 million tonnes in 2020. The Energy Saver Incentive, a scheme created by the Victorian Energy Efficiency Target Act (VEET Act) to facilitate the reduction of greenhouse gas emissions, also provides an opportunity for government to save money when undertaking certain energy efficiency activities. 3. For every 1 tonne of greenhouse gas abated as a result of a prescribed activity, the accredited business can generate 1 certificate representing this abatement. 4. The accredited business can then sell the certificates to energy retailers to enable the retailer to meet their VEET liability. 5. In anticipation of this sale, the accredited business may provide the energy consumer with a discount because the business can sell the certificates generated as a result of the energy saving activity undertaken on behalf of the consumer. The discount is provided at the time the accredited business is engaged. 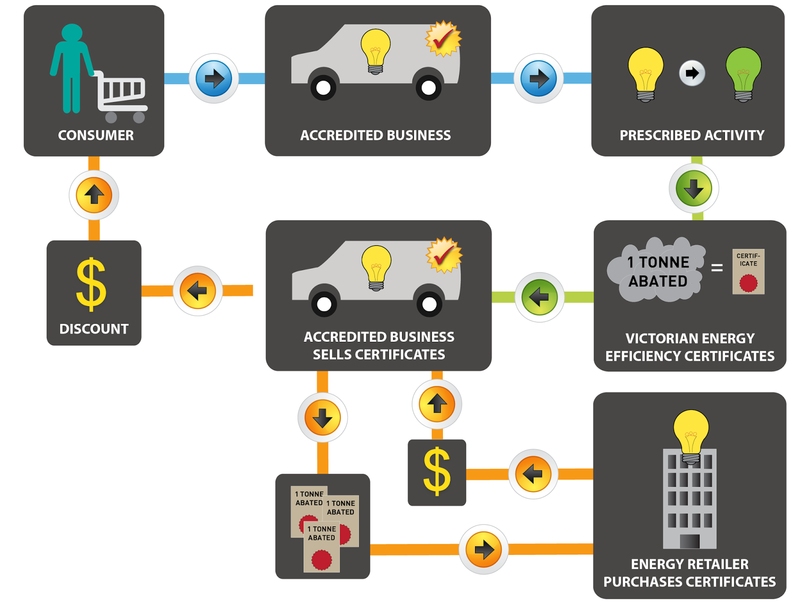 Victorian Government's Energy Saver Incentive website: http://www.energyandresources.vic.gov.au/energy/about/legislation-and-regulation/energy-saver-incentive. Effecting a fair dismissal is not impossible – a recent decision of the Fair Work Commission illustrates the importance of the ongoing management of unsatisfactory performance and a fair approach. Pickles Auctions dismissed an employee one afternoon after he arrived at work over one hour late that morning because he had slept through his alarm. The employee had a history of habitual lateness without prior notification to his Supervisor and had received at least 6 formal warnings regarding his performance and conduct (including lateness). The FWC held that it should have come as no surprise to the employee that this occasion of late attendance might represent 'the straw that broke the camel's back'. convening a further meeting with the employee to inform him that his employment was terminated and providing both verbal and written notice of the reason for dismissal. Not every dismissal (perhaps particularly in the public sector) will be as straightforward as this one but, no matter how complex the situation, the focus should be on proactively managing each instance of unsatisfactory performance by notifying the employee and giving them an opportunity to respond on each occasion.